What is web scraping service? Quite often while contemplating the next big move, we wish that we had more insight into what is happening in and around the industry. Given the depth of the internet and the metaphorically infinite amount of data it contains, it is being widely under-utilized. People engaging in strategic activities on a routine basis are not new to the terms - web harvesting, web extraction and web data scraping. Web scraping is essentially a service where an algorithm driven process fetches relevant data from the depths of the internet and stores it on a centralized location (think excel sheets) which can be analyzed to draw meaningful and strategic insight. To put things into perspective, imagine the internet as a large tank cluttered with trillions of tons of data. Now, imagine instructing something as small as a spider to go and fetch all data relevant to your business. The spider works in accordance with the instructions and starts digging deep into the tank, fetching data with an objective orientation, requesting for data wherever it is protected by a keeper and being a small spider, it fetches data even from the most granular nook and corner of the tank. Now, this spider has a briefcase where it stores all collected data in a systematic manner and returns to you after its exploration into the deep internet tank. What you have now is perfectly the data you need in a perfectly understandable format. This is exactly what a web scraping service entails except the fact that it also promises working on those briefcase data and cleaning it up for redundancies and errors and presents it to you in the form of a well consumption-ready information format and not raw unprocessed data. Now, there is a high possibility that you may be wondering how else can you utilize this data to extract the best RoI- Return on Investment. The best part about having aggressive competitors is that you just by alert monitoring of their activities, you can outpace them by enhancing off of their big move. The industries are growing rapidly, only the informed are ahead of the race. Web scraping ensures aggregating of all data in a centralized location. Say goodbye to the cumbersome process of collecting bits and pieces of raw data and spending the night trying to make sense out of it. While decentralization is good, the boss needs to do what a boss does- hold the reins. Track your distributors who blatantly ignore your list prices and web miscreants who are out with a mission to destroy your brand. It’s time to take charge. Pricing is of the most crucial aspect in the product mix and your business model- you get only one chance to make it or break it. Stay ahead of the incumbents by monitoring their pricing strategy and make the final cut to stay ahead of time. The top tip to stay ahead in the game is to keep all your senses open to receive any change. Stay updated about everything happening around your sphere of interest and stay ahead by planning and responding to prospective changes. Understand your market well. Web scraping as a service offers you the information you need to be abreast of the continuous evolution of your market, your competitors’ responses and the dynamic preferences of your customer. We all know that a customer is the sole reason for the existence of a product or business. Lead generation is the first step to acquiring a customer. The simple equation is that more the number of leads, higher is the aggregate conversion of customers. Web scraping as a service entails receiving and creating a relevant – relevant is the key word – relevant lead generation. It is always better to target someone who is interested or needs to avail the services or product you offer. With web extraction services, you can extract more juice out of the data you have. The ready to consume format of information that web scraping services offer allows you to match it with other relevant data points to connect the dots and draw insights for the bigger picture. Continuous improvement is the key to building a successful brand and consumer feedback is of the prime sources that will let you know where you stand in terms of the goal – customer satisfaction. Web scraping services offer a segue to understanding your customers’ review and help you stay ahead of the game by improvising. In the dynamic industry of finance and ever-volatile investment industry, know what’s the best use of your money. After all, the whole drama is for the money. Web scraping services offer you the benefit of using alternative data to plan your finances much more efficiently. The information derived from a web scraping process is almost ready to be run through for a research and analysis function. Focus on the research instead of data collection and management. Understanding risk and evolving regulations is important to avoid any market or legal trap. Stay updated with the evolving dynamics of the regulatory framework and the possible risks that mean significantly for your business. 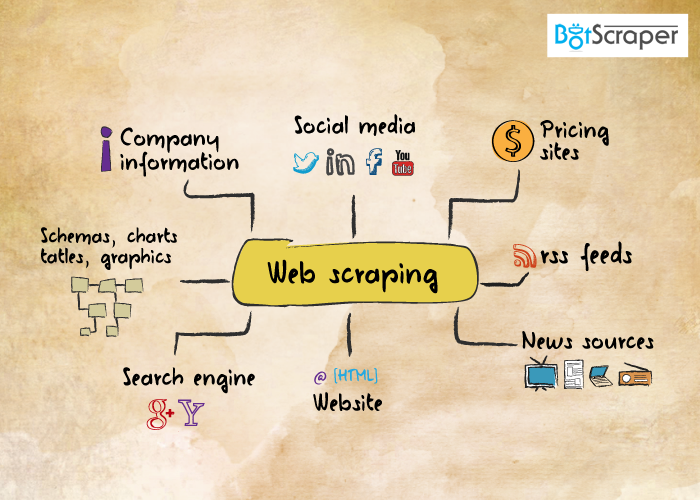 Botscraper ensures that all your web scraping process is done with utmost diligence and efficiency. We at Botscraper have a single aim - your success and we know exactly what to deliver to ensure that.